Welcome to a world where there's more than enough space for all your indulgences. 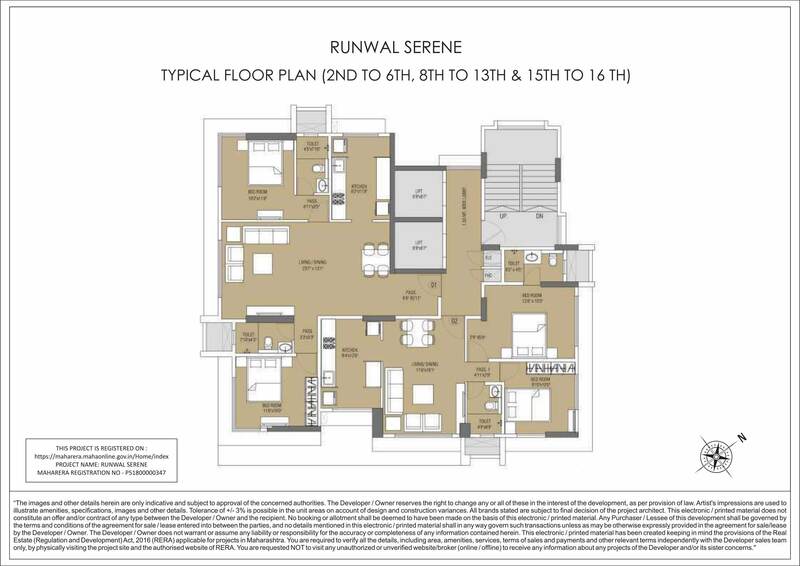 Presenting Runwal Serene - a residential project where comfort and convenience is in every step of the way. The development is located at Govandi, just 10 minutes from the vibrant locale of Chembur. Located close to Chembur & Eastern Freeway, Runwal Serene presents spacious residences that offer lush views amidst unhindered tranquility, yet connected to the brisk city life. Bringing together the elements of a perfect life: Well-designed conveniences, accessible location, city-life treats and lasting serenity. Established in 1978, the Runwal Group is one of Mumbai’s premier real estate developers, operating in the residential, commercial and organized retails verticals. With a robust track record of 50 delivered projects with over 10 thousand families happily living, the group has continuously striven to keep the ‘customer’ as a focal point in the designing, planning and construction of all its projects. Operating in the Luxury, Premium and Large-Format Townships categories in residential development, the Runwal Group today also owns and manages the largest retail mall chain in Mumbai with over 2 million sq. ft. of GLA that includes R City Mall, Ghatkopar (W) – which is Mumbai's Biggest Mall, R Mall, Mulund, R Mall, Thane and R Odeon, Ghatkopar (E). The Group currently manages a portfolio of 14 ongoing projects with almost 11 mn sqft under development across Mumbai and the MMRDA region. One of the fastest growing entities in the sector the group claims to have operated with excellent customer care levels and the highest standards for the welfare of society and the environment since the last 3 decades. 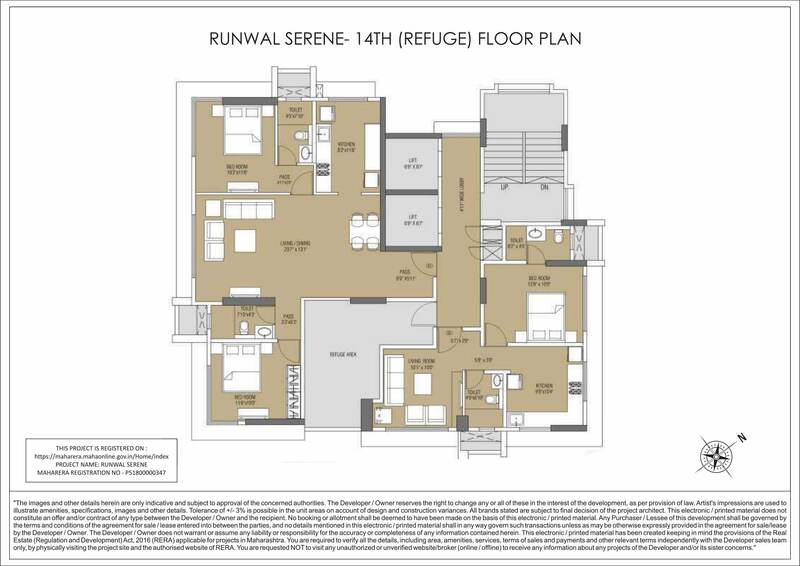 The plans, specifications, images and other details herein are only indicative. The Developer / Owner reserves the right to change any or all of these in the interest of the development, without prior notice or obligation. 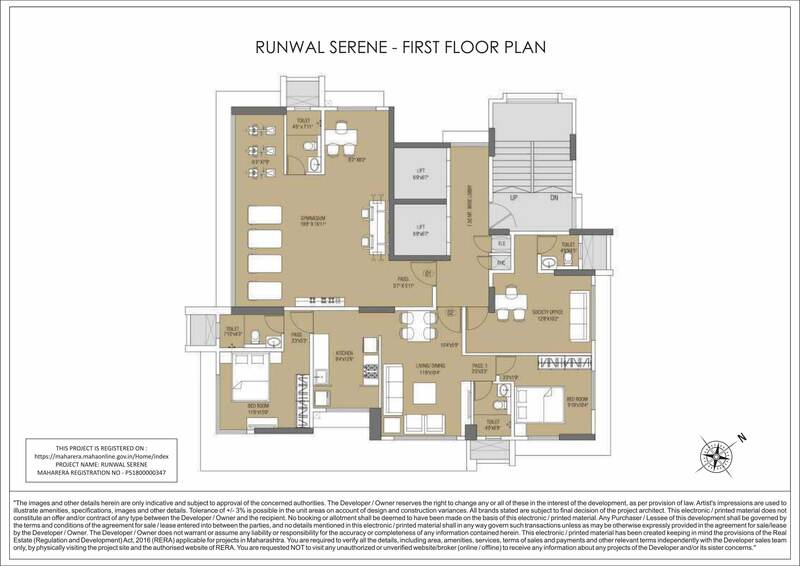 Artist’s impressions are used to illustrate amenities, specifications, images and other details and these may be applicable to select apartments only. Tolerance of +/- 3% is possible in the unit areas on account of design and construction variances. All brands stated are subject to final decision of the project architect. This printed material does not constitute an offer and/or contract of any type between the Developer / Owner and the recipient. No booking or allotment shall be deemed to have been made on the basis of this printed material. Any Purchaser / Lessee of this development shall be governed by the terms and conditions of the agreement for sale / lease entered into between the parties, and no details mentioned in this printed material shall in any way govern such transactions unless as may be otherwise expressly provided in the agreement for sale/lease by the Developer / Owner. The Developer / Owner does not warrant or assume any liability or responsibility for the accuracy or completeness of any information contained herein. Project financed by HDFC Ltd and NOC / permission of HDFC Ltd will be obtained for sale of property, if required.